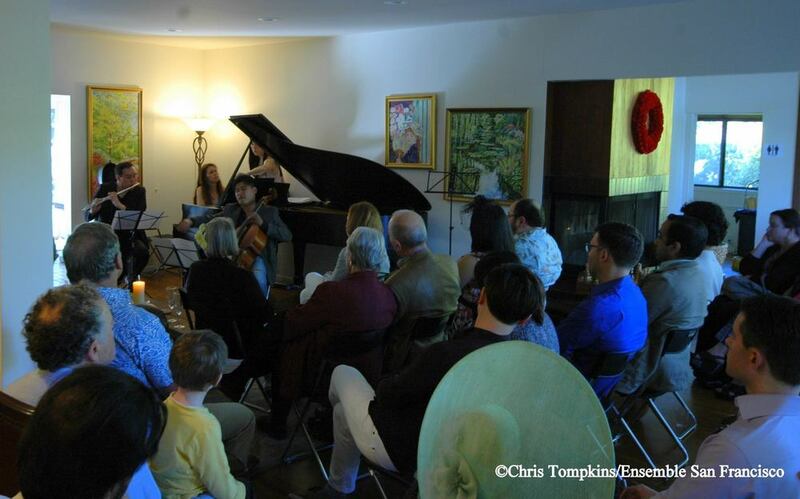 In celebration of Earth Day, ESF presented an afternoon of chamber music, mingling, drinks and appetizers. Our audience set the mood with colorful and bright summer attire. Much thanks to Maria and Katia Karpenko for hosting the event. Ensemble San Francisco presented the world premiere of a new set of songs by composer Jose Gonzalez Granero, featuring baritone Efrain Solis (an Adler fellow at the San Francisco Opera). Jose, principal clarinetist of the SF Opera orchestra, joined Jonah and Christine to perform the first movement of the Brahms Trio for Clarinet, Cello, and Piano. Afterwards, the musicians joined audience members for brats and beers at nearby Mikkellar Bar. An elegant party featuring a short concert by Ensemble San Francisco. Music included the Bach Concerto for Two Violins, the Theme and Variations movement from Schubert’s Trout Quintet, and Rossini’s Duo for Cello and Bass. ESF performed in Classical Revolution’s series at Salle Pianos. Ensemble SF performed Faure and Milhaud at Classical Revolution in San Francisco. Afterwards, audience members joined in to sightread movements from Schumann’s Piano Quintet.